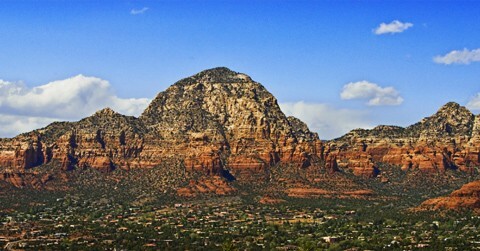 The red rocks of Sedona featuring Capitol Butte and Coffee Pot Rock, on the right side. This was taken from Airport Road overlooking the city. Single shot from 2006 with the Nikon D200, no tripod, F16, 29mm cropped. Beautiful day it was.